Happy Friday everyone! I hope your first week of June was great. 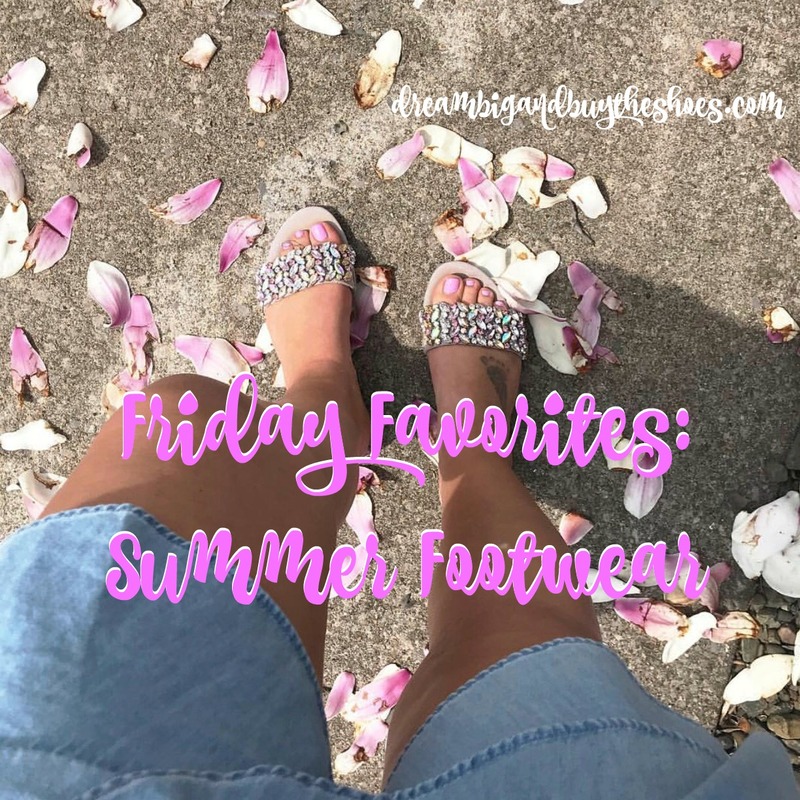 There are still so many sales happening, and I wanted to share some of my favorite shoes, sandals and slides that I've found for Summer. There's so many great options and a wide variety here. Let's take a look around. Christine shared her new Adidas slides a few weeks ago on Insta-stories and I about died...how cute. I'm debating between that print or these leopard Adidas slides. I may be bold and go with the leopard! A New Day block heels- I purchased these in a pretty lilac color and have received so many compliments on them in the one day I've worn them so far. They're comfortable and so fun. TOMS peep toe bootie- I have these in 2 colors and wear the heck out of them. They are beyond comfortable and you can last all day and night in them- worth every dollar. Steve Madden ankle strap sandal- I love these to pair with jeans for a classic look and with work pants or dresses to look professional and chic at the office. They're a great staple sandal. Nike women's slides- I bought these to wear with my Nike leggings to Ethan's soccer games and running errands...they're so nice to just throw on and go. Old Navy bow slides- Can you tell I'm really in to slides this season?! SO comfy- I just can't resist. These bow ones add a cute twist to any outfit! Express jeweled slide sandals- Own these and love, love, LOVE them. I've had so many people comment on them and a few friends purchase them too- they are so pretty. American Eagle denim cork slide sandals- Last but not least, one more pair of slides ( are you sick of me yet?!) HA! These are so cute and would be great with all those Old Navy swing dresses I have. See anything here you like?! What are you in to this Summer in terms of footwear? Enjoy your weekend friends, xo!